Home » Investing » Stocks » Dot-Com Bubble 2.0? Back in the late 1990s and early 2000s, it was a rat race to be the next major tech company. We all knew the power of the internet, and how it would eventually mint new billionaires and billion-dollar companies. We just didn’t know which ones would win. So we went through a few years where just about any company could place a dot-com extension to its name and go public. Investors didn’t care how much money those companies were making, or even if they could ever turn a profit. They just wanted in on the fun, and needed their capital to have some exposure to the next major investment era. It was a historic time. With that said, today is also a historic moment. 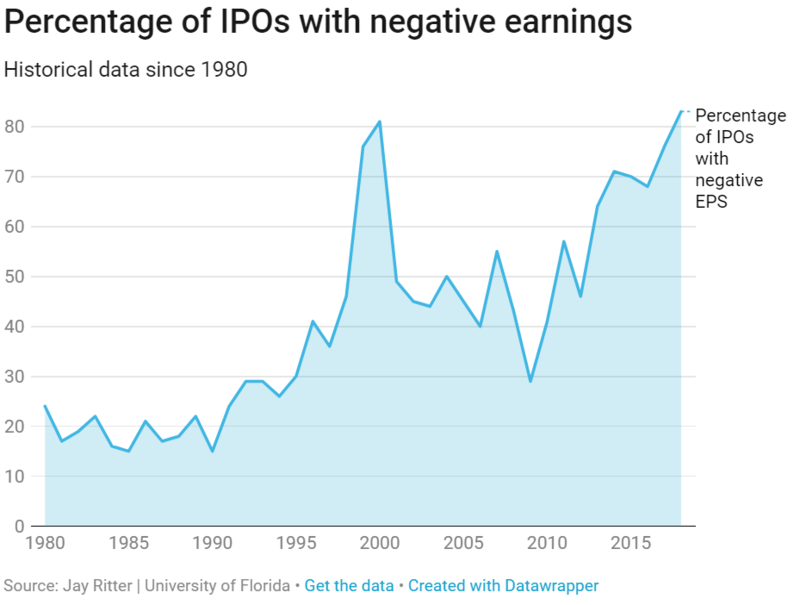 It might shock you, but there’s a higher percentage of companies going public right now that are not profitable than at any point in the last four decades. Up until last Friday, 83% of the U.S. companies going public this year have lost money in the year before going public. The highest point in 2000, at the peak of the dot-com bubble, was 81%. Cresting that previous high signals that we are in the midst of yet another initial public offering (IPO) bubble. This time it’s not a race to capture the tech revolution. But it’s still a race to grab investors’ money before interest rates keep rising higher. With rates remaining relatively low, investors are still seeking the next best thing. And an IPO of a startup company is an exciting opportunity, even if it has yet to be profitable. Even though the percentage of companies going public that are failing to turn a profit is alarming, don’t expect the markets to crash anytime soon. As I mentioned on Monday, we are entering the best six-month period for the stock market, historically speaking. So don’t let this stat keep you out of the markets. It would be wise to avoid many of the companies going public right now, though, especially ones that are reporting net losses at the time. « Previous Will The Fed Crash the Market?